Home » Hiking Tips » Food and Hydration for Hikers » How much water to take on a hiking trip? How much water to take on a hiking trip? Hiking is a strenuous activity which makes our body rapidly lose fluids and thus sufficient hydration during a hike (as well as before and after) is very important. Failing to provide your body with enough water results in decreased physical and mental performance and can in the most severe cases cause delirium, unconsciousness and death. 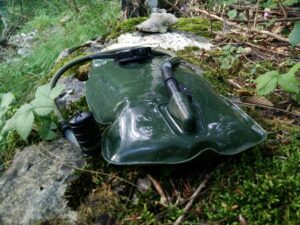 If you have possibility to refill your water bottles or reservoir during the hike (but be sure to check this before going as noted in the article How to plan a hiking trip), you have less to worry about while having to carry all the water needed can be quite heavy (1 liter equals to 1 kilogram) and thus slows you down significantly. This brings many hikers (including me) in a dilemma, asking themselves: How much water do I really need for a hike? While the human body naturally gets rid of superfluous fluids via urination and excretion, we are here more concerned with loss of fluid through perspiration, e.g. sweating. How much one sweats during exercise depends enormously on the individual, although as a rule of thumb men sweat more than women and people who are fit sweat more than those who exercise less as regular physical activity cause the body to create more sweat glands to help it to cool off more efficiently. To measure the amount of sweat you perspire and thus estimate (see below) how much water you need for a physical activity such as hiking, you can calculate your sweat rate per hour. To do this you need to weigh yourself before and after a shorter hike (as you shouldn’t go to the toilet in-between) and keep track of the water you consume during the exercise as well as the length of the exercise. 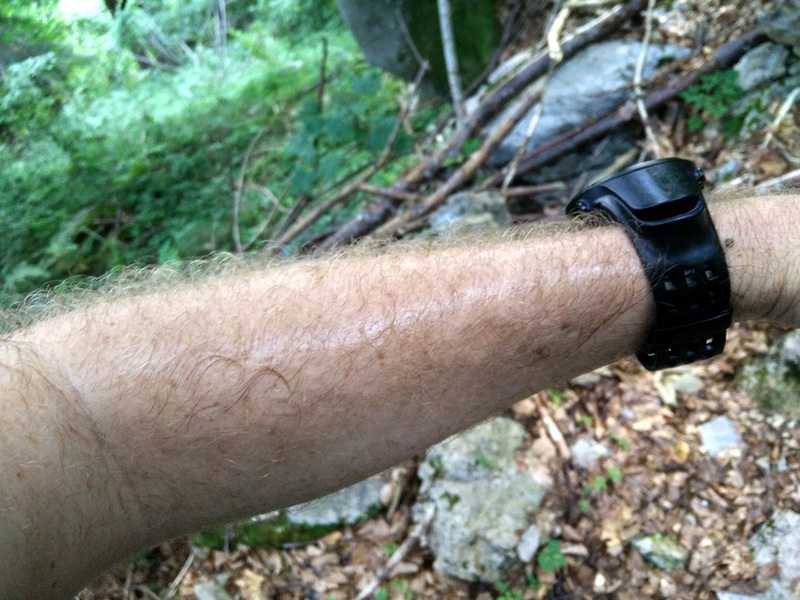 The result tells you how much fluid you lose per hour of hiking. However, keep in mind that the calculated sweat rate is only applicable for that particular activity executed under those particular weather conditions as your sweat rate (of course) increases with your heart rate and the temperature and humidity of your surroundings. Thus your sweat rate will differ greatly for hiking in relatively flat terrain on a cool spring morning when compared to trail-running in the height of summer. To illustrate how much the weather conditions (e.g. temperature and humidity) influence the sweat rate, I conducted the same hike in the same tempo (and thus similar average heart rate) on two different days with slightly different temperature and humidity. For comparison, I can relate that the highest recorded sweat rate for an athlete in an exercise situation was 3700 milliliters per hour. How much fluid can you lose without hindering your performance? Long hikes include rest phases where heart rate as well as sweat rate temporarily decreases. On long hikes weather and temperatures change. You can make sure to be well-hydrated before starting the hike. It’s fine to return from a hike slightly dehydrated. So, how much is “slightly dehydrated”? How much fluid can you lose without impairing your performance significantly? Researches state that a body fluid loss equivalent to 2 percent of body weight is tolerable by most athletes and doesn’t impair the performance. In my case (80 kilograms) this means that I can lose up to 1.6 liters (1.6 kilograms) of fluid without decreasing my performance. Allowing for 2 % drop in body weight, it would mean that I should drink 3.2 liters (4.8l – 1.6l) during the imagined 6-hour hike. If the body looses more than 2 percent of body weight in fluid, different symptoms such as decreased performance and heat regulation appear. Researchers estimate that athletes who lose 5% of their body weight in fluid, have a reduction in performance of 30 % in average. Anything above a 5% loss causes more severe symptoms such as headache, irritability and fatigue. However, keep in mind that some might experience dehydration symptoms sooner or later than others. If I would drink no water whatsoever on the imagined 6-hour hike, I would lose the 4.8 liters of fluid and thus 6 % of my total body weight, which would for sure entail some of these negative symptoms. While you hike, it is a good idea to monitor your hydration status. We might not always feel thirsty in spite of being dehydrated, which is why it is a good idea to regularly check your urine’s color. If it’s pale it means that you are well-hydrated while if it’s dark yellow it means that you suffer from severe dehydration. Additional signs of dehydration to look for are lack of concentration, headache, redder skin, irritation, confusion and disorientation. During the hike you should continuously take small sips of water as there is a limitation how much water the body can absorb at once. Researchers claim that even in ideal circumstances the body can only absorb up to 800 milliliters of water per hour. Also keep in mind that cool water is absorbed more effectively than warm water. It is very likely that you will be slightly dehydrated after the hike and thus it’s vital that you drink extensively for the next couple hours. In warm weather I would recommend using a hydration system as it allows you to take small sips of water throughout the hike (even when scrambling/climbing). For more information, read our article Hydration Systems VS Water Bottles. It’s not only important to hydrate during the hike but also before and after the hike. Experts recommend drinking five to seven milliliters of water per kilogram of body weight before going on a hike. Bad planning – the hike takes more time than anticipated. Verdict: How much water to bring for a hike? 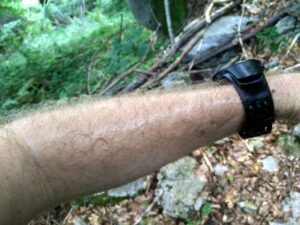 By calculating your sweat rate you can figure out how much fluid you lose per hour of hiking, but there is no need to bring this exact amount of water as you can lose up to two percent of your body weight in liquid without impairing your performance. Furthermore, long hiking trips include rest phases and changing weather which additionally decrease the fluid loss. You should, however, make sure to be well-hydrated before the hike as well as replenish your fluids after the hike by having extra water ready in your car etc.